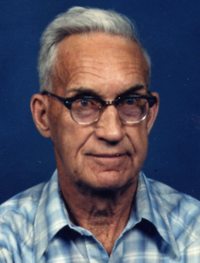 Roy Elmer Sisiam, 88, died Thursday, April 5, 2007, at his home in Bellevue, Idaho, after a long illness. Roy was born March 17, 1919, in Bellevue. He grew up in Bellevue, attended all his schooling there, and graduated from the Bellevue High School. He married Violet Richardson, a Twin Falls native, on Sept. 15, 1941, at the Bellevue Community Church. Roy served in the U. S. Army during WW II, earning the Purple Heart, Asiatic Pacific Service Medal, Philippine Liberation Medal and the Bronze Service Star. Over the course of his life, Roy worked as a farmer, miner, as a "gandy dancer" doing railroad maintenance, and for the Sun Valley Co. as a ski lift operator and doing golf course maintenance. Roy's special interests included hunting, fly fishing, reading and crossword puzzles. He was an honest, hard working husband, father, grandfather and great grandfather. Surviving family members include his wife of 66 years, Violet Sisiam; his son Roy (Leslie) Sisiam, Jr. of Greenwood, S.C., and grandsons Joseph and David Sisiam; his son Larry Sisiam and granddaughter Megan Sisiam; his daughter Debbie (Darrell) Gamble of Coeur d'Alene, Idaho, and grandchildren Travis Pyle and Tara Swift; his son Rusty (Sandy) Sisiam of Clayton, Idaho; his son Todd (Judy) Sisiam of Fairfield, Idaho, and grandchildren Tony Marcroft, Marina, Samantha and Lucas Sisiam and his brother Wolford Sisiam of Hailey, Idaho. Roy was preceded in death by his parents and his son, Leslie J. Sisiam. Graveside services will be at 2 p.m. Friday, April 13, at the Bellevue Cemetery. Rev. Tad Walton of the Bellevue Community Church will be the speaker. Urn interment will follow the services. Arrangements are under the care of Wood River Chapel of Hailey.